Some concerts listed below contain links to posters/videos of the Chorus performing etc. 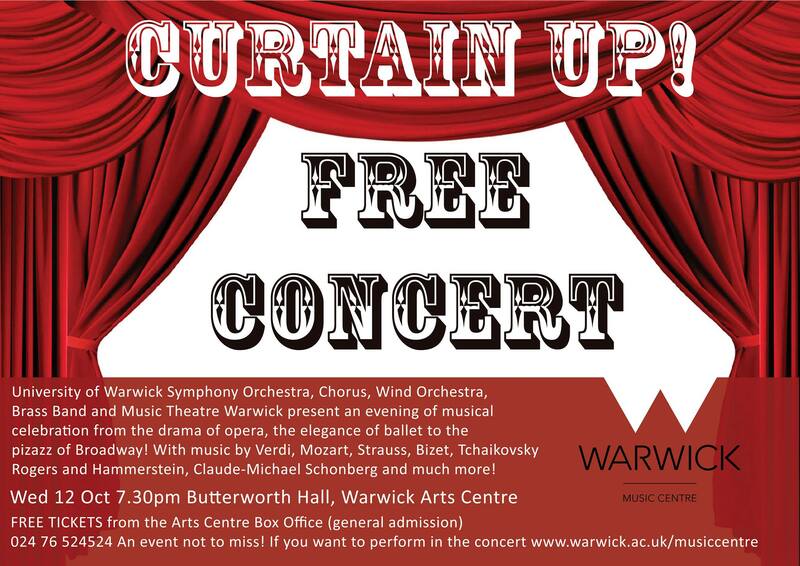 All concerts are with University of Warwick Symphony Orchestra (UWSO) unless otherwise stated. Beethoven Symphony No. 9 and Tchaikovsky 1812 Overture [Flyer] – Sun 24 June 2018 – Conductor: James Ham – Butterworth Hall, Warwick Arts Centre. 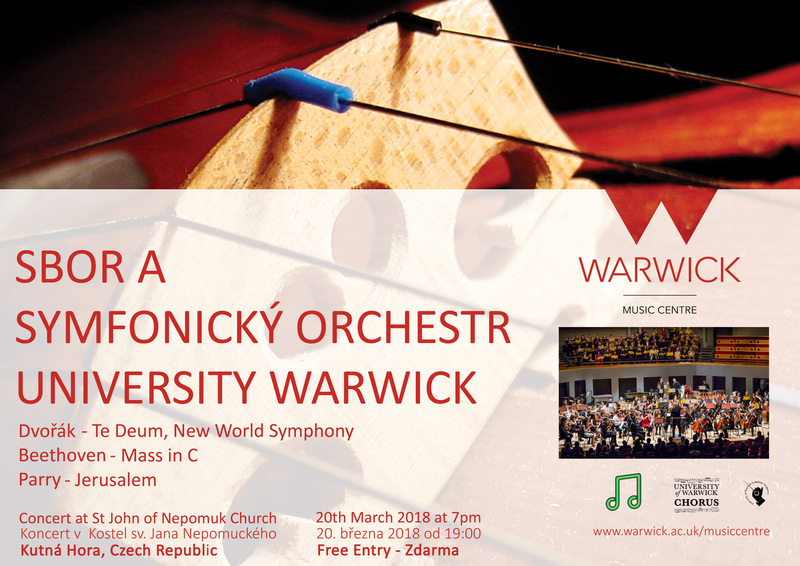 Prague Tour 2018 (with UWSO) – Kutná Hora Concert [Flyer] – Tuesday 20th March 2018 – Conductor: James Ham – St John of Nepomuk Church, Kutná Hora, Czech Republic. Beethoven Mass in C, Dvorak Te Deum, Parry Jerusalem. Prague Tour 2018 (with UWSO) – Prague British School Concert – Monday 19th March 2018 – Conductor: James Ham. Beethoven Mass in C, Dvorak Te Deum. 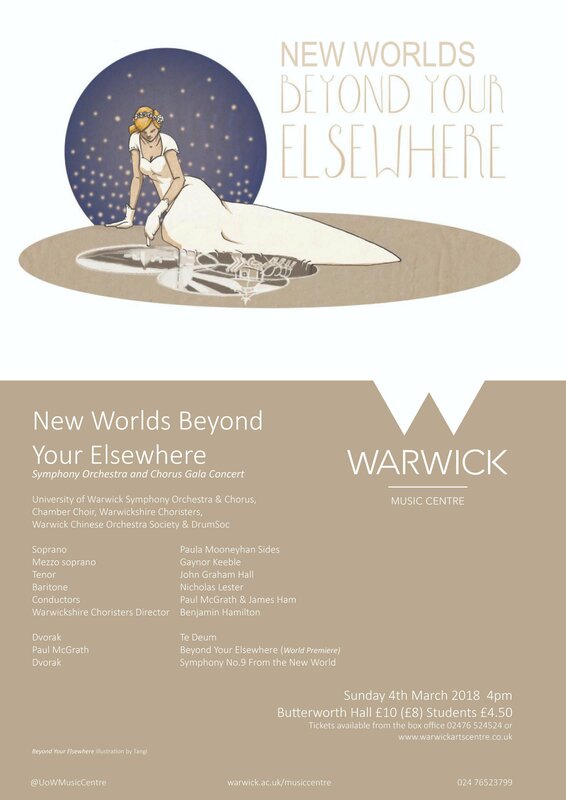 Beyond Your Elsewhere (McGrath) [Information Page including BYE Learning Tools], Te Deum (Dvorak) [Flyer] – Sunday 4th March 2018 – Conductor: Paul McGrath – Butterworth Hall, Warwick Arts Centre. World Première of Beyond Your Elsewhere, written by Director of Music Paul McGrath. 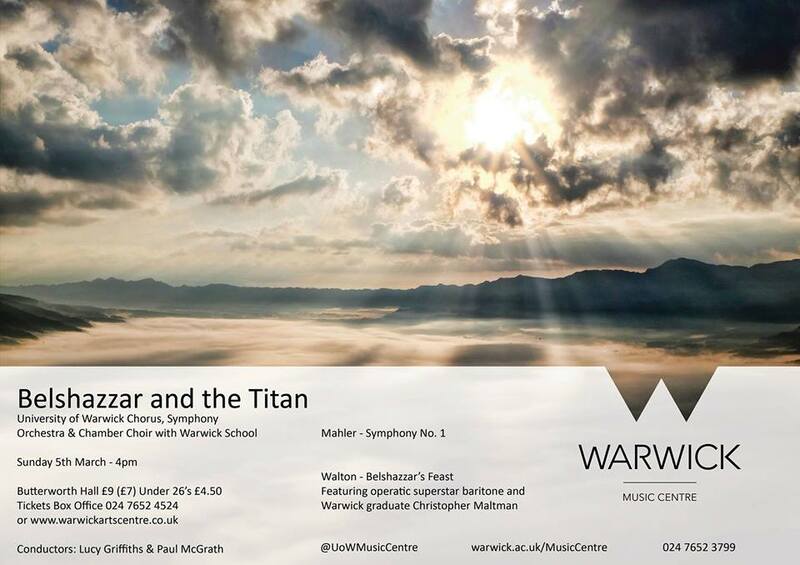 Performed with University of Warwick Symphony Orchestra, Chamber Choir and Chinese Orchestra. CU Carol Concert [live stream] [Flyer] – Tuesday 5th December 2017 – Conductor: Paul McGrath – Butterworth Hall, Warwick Arts Centre. 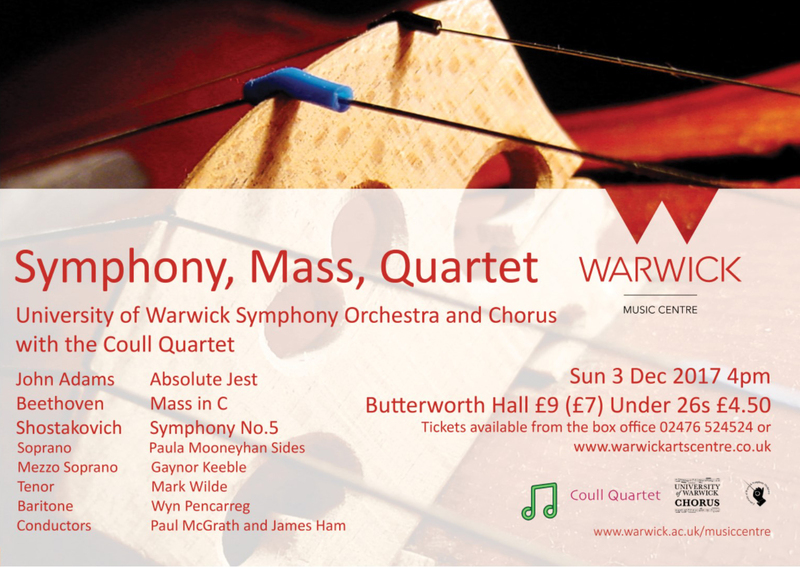 Beethoven’s Mass in C [Flyer]- Sunday 3rd December 2017 – Conductor: James Ham – Butterworth Hall, Warwick Arts Centre. 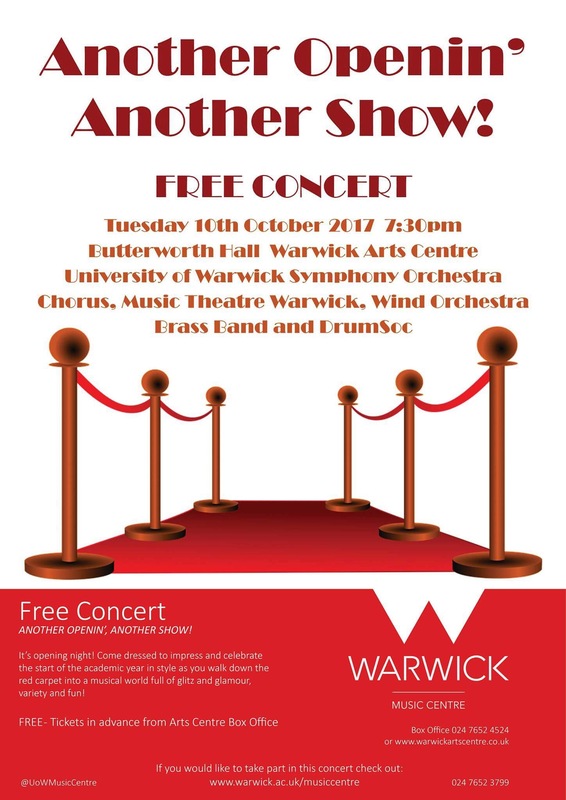 Free Concert [Flyer] – Tuesday 10th October 2017 – Conductors: Paul McGrath and James Ham, with all university music groups – Butterworth Hall, Warwick Arts Centre. Mozart’s Requiem [Flyer] – Sunday 25th June 2017 – Conductor: Lucy Griffiths – Butterworth Hall, Warwick Arts Centre. 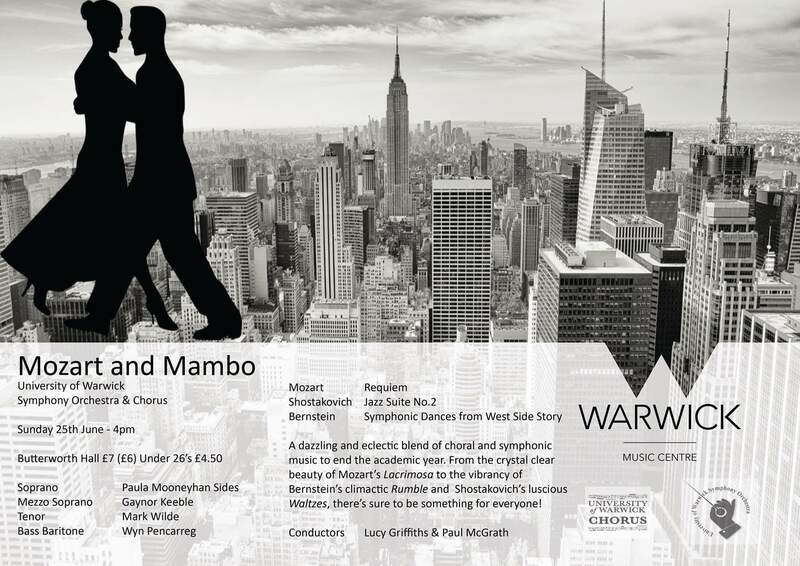 Belshazzar’s Feast [Flyer] – Sunday 5th March 2017 – Conductor: Lucy Griffiths, with guest soloist Christopher Maltman, Chamber Choir, UWSO and Warwick School Brass Bands – Butterworth Hall, Warwick Arts Centre. 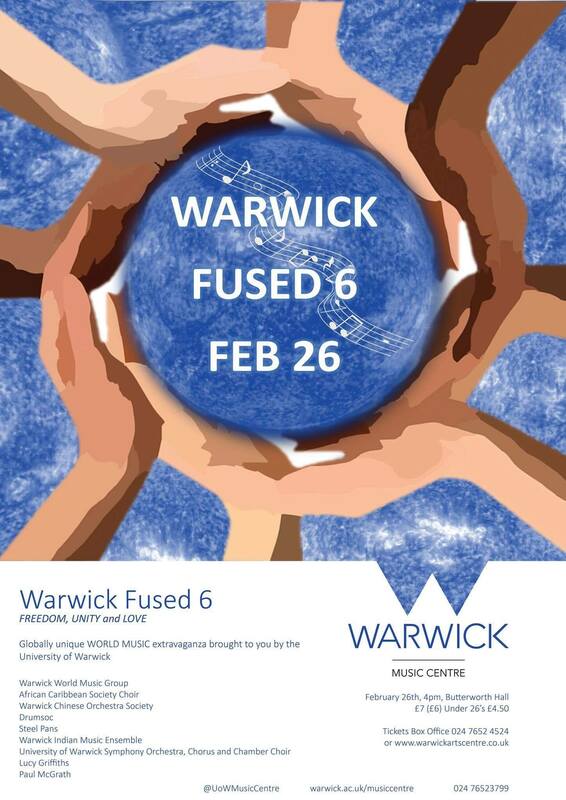 Warwick Fused 6 [Flyer] – Sunday 26th February 2017 – Conductor: Paul McGrath, with UWSO and world music groups – Butterworth Hall, Warwick Arts Centre. [Video recording of Beyond Your Elsewhere: Part 1, Part 2, Part 3]. 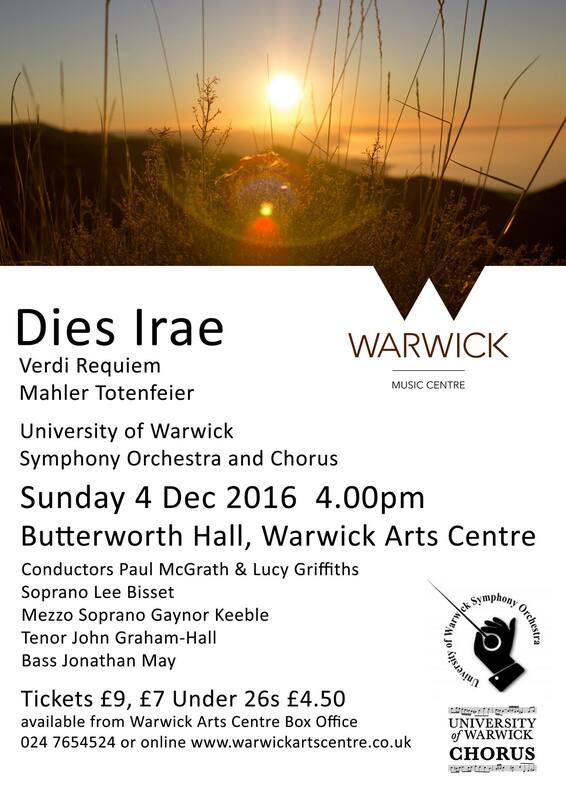 Verdi’s Requiem [Audio Recording], [Flyer] – Sunday 4th December 2016 – Conductor: Paul McGrath – Butterworth Hall, Warwick Arts Centre. Free Concert [Flyer] – Wednesday 12th October 2016 – Conductors: Lucy Griffiths and Paul McGrath, with all university music groups – Butterworth Hall, Warwick Arts Centre. 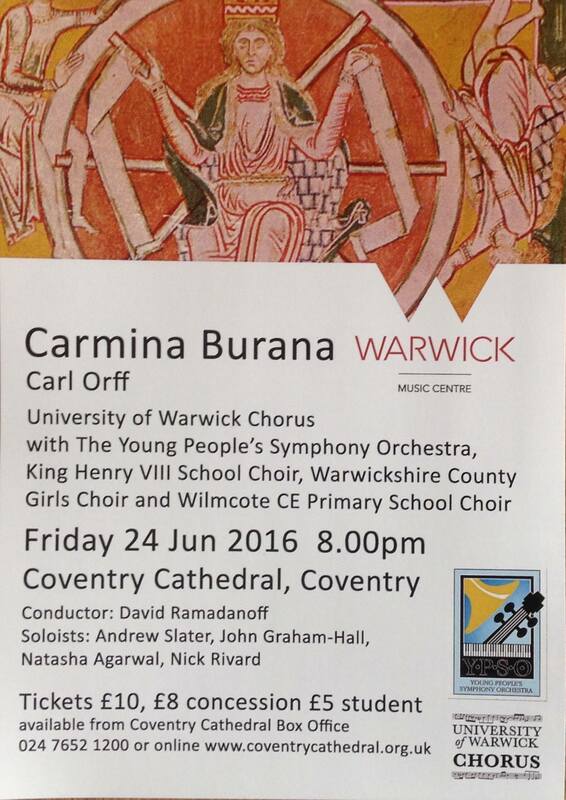 Carmina Burana [Video Recording], [Flyer] – Friday 24th June 2016 – Conductor: David Ramadanoff, with Young People’s Symphony Orchestra from California – Coventry Cathedral. Slovenia Tour 2016 (with UWSO) – Haydn’s The Creation [Flyer] – Tuesday 22nd March 2016 – Conductor: Lucy Griffiths – Celje Dom, Celje, Slovenia. Slovenia Tour 2016 (with UWSO) – Haydn’s The Creation [Flyer] – Monday 21st March 2016 – Conductor: Lucy Griffiths – St James Church, Ljubljana, Slovenia. 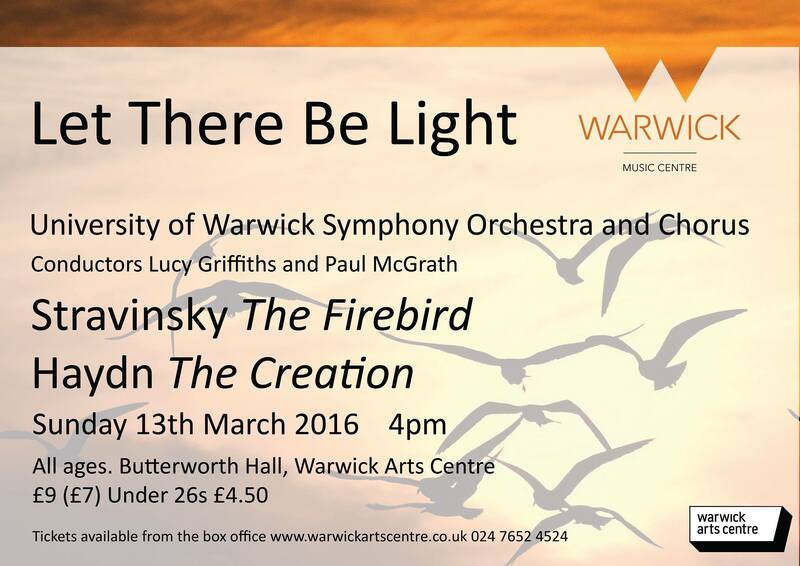 Haydn’s The Creation [Flyer] – Sunday 13th March 2016 – Conductor: Lucy Griffiths – Butterworth Hall, Warwick Arts Centre. 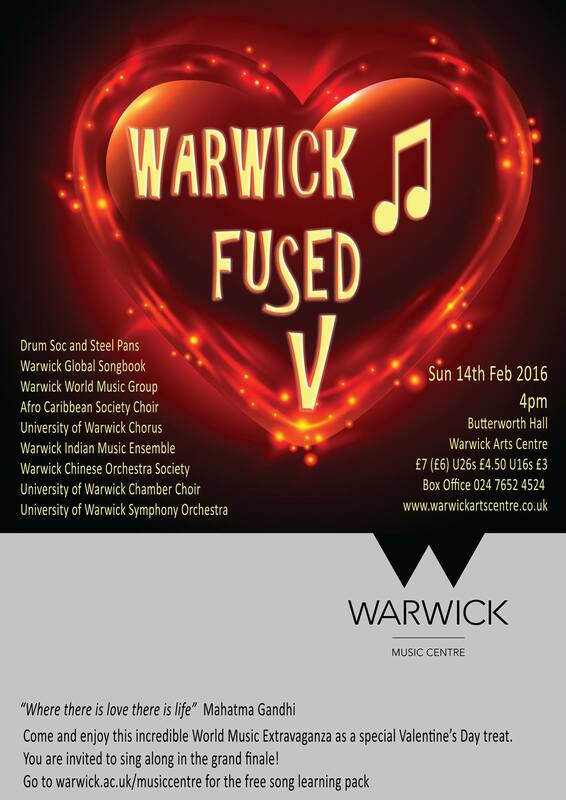 Fused V [Flyer] – Sunday 14th February 2016 – Conductor: Paul McGrath, with UWSO and world music groups – Butterworth Hall, Warwick Arts Centre. 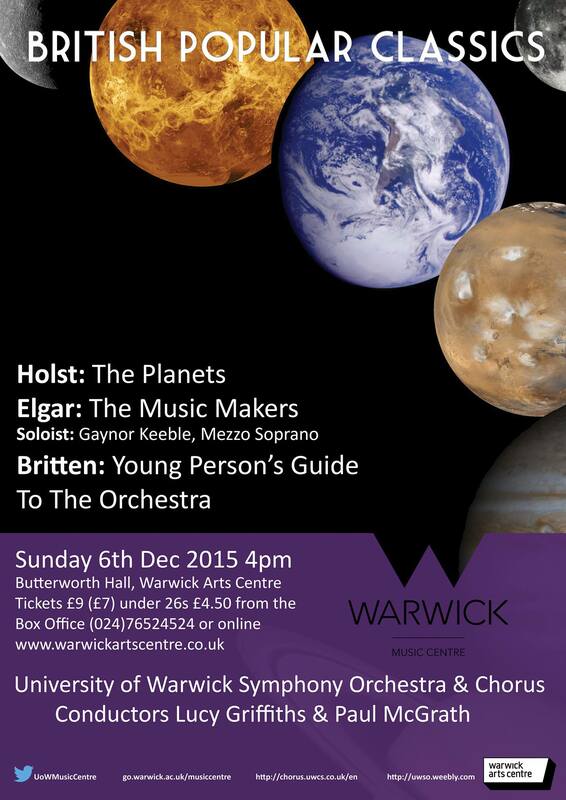 Elgar The Music Makers [Flyer] – Sunday 6th December 2015 – Conductor: Paul McGrath – Butterworth Hall, Warwick Arts Centre. 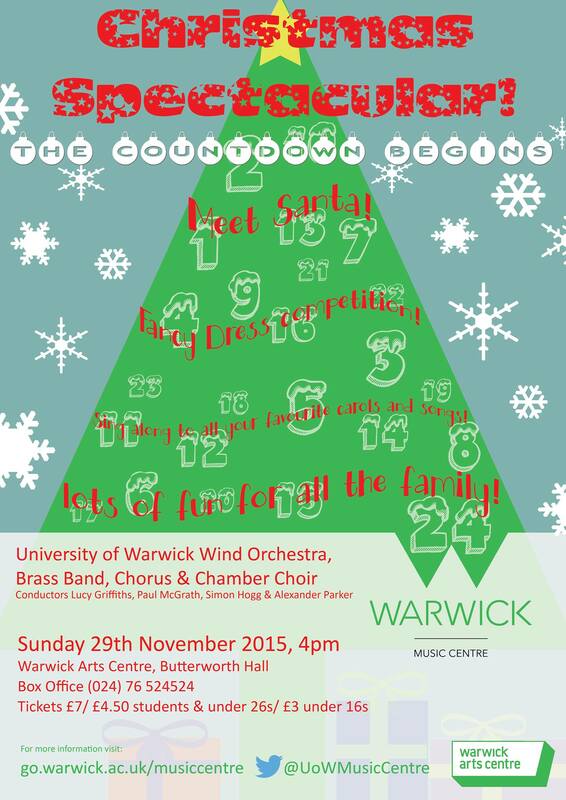 Christmas Spectacular [Flyer] – Sunday 29th November 2015 – Conductors: Lucy Griffiths and Paul McGrath – Butterworth Hall, Warwick Arts Centre. 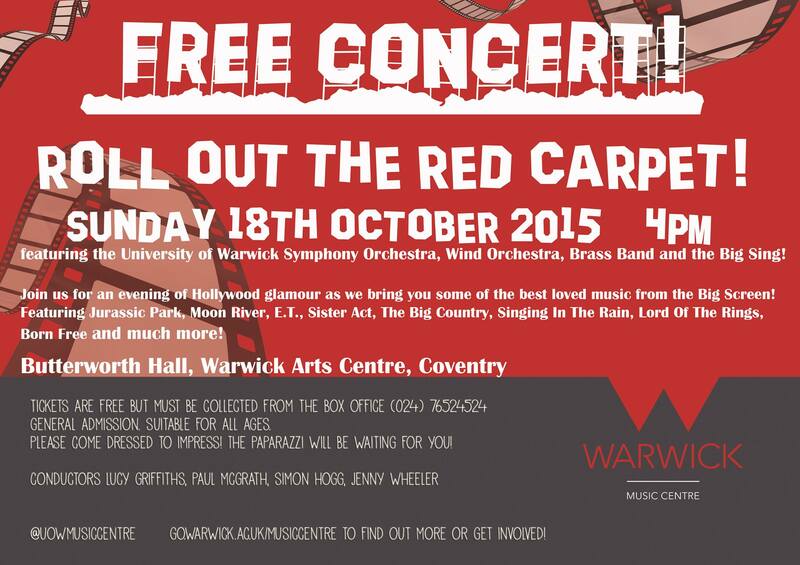 The Big Sing [Live Stream], [Flyer] – Sunday 18th October 2015 – Conductors: Lucy Griffiths and Paul McGrath, with all university music groups – Butterworth Hall, Warwick Arts Centre. See this document for a complete record of Chorus performances since 1983 until the end of Academic Year 2014/15: Chorus Concert Records.xls (updated 27th June 2017). We are very happy to receive corrections/amendments. Please email them to us at uow.chorus@gmail.com. Many thanks to Phil Hodgson for his ongoing help with this list.